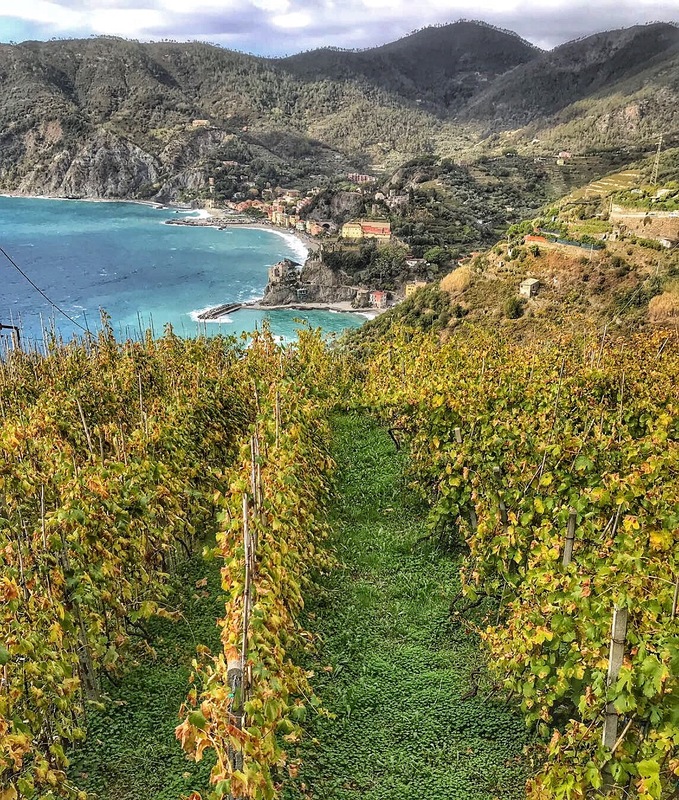 Cinque Terre…five stunningly beautiful villages stretching down the Ligurian coast, complete with pastel houses clustered above picturesque harbours from which the landscape twists up into the grapevine covered hills. 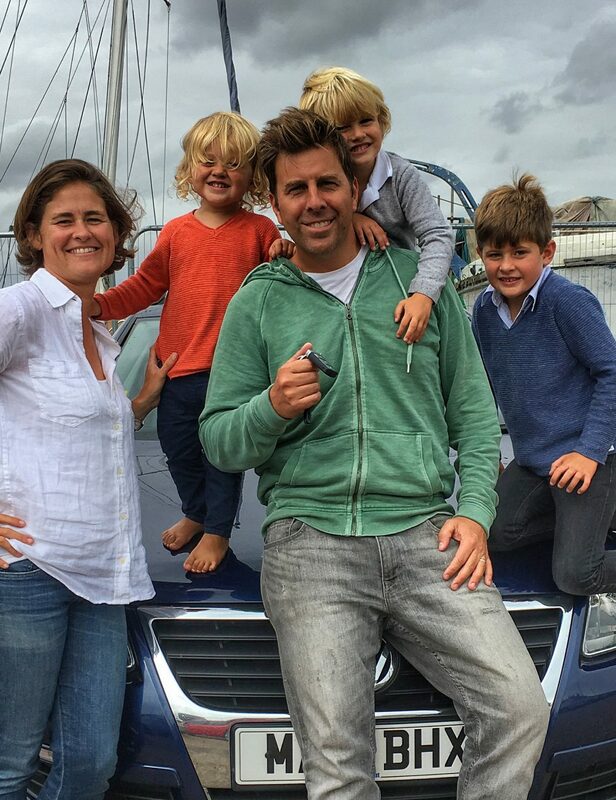 Clear blue water…breathtaking sunsets…seaside dining…and three kids?? 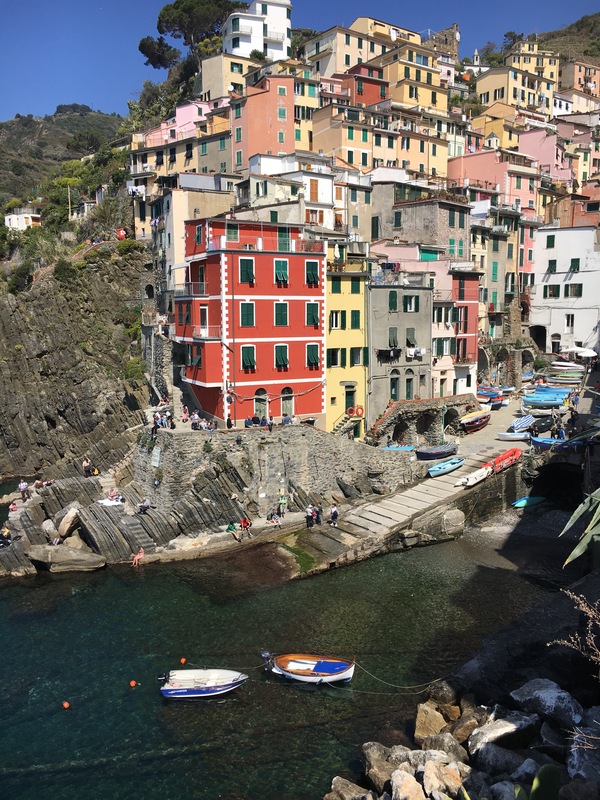 Cinque Terre is not the first place you think of for a family holiday with small children. For a romantic weekend away or even a honeymoon..of course. But is this where you want to be when your youngest son announces, in his best outdoor voice, that he wiped his own bottom that morning? That said, as a selfish intrepid travel dad, I wasn’t going to let the possibility of disrupting a few newlyweds, who (a) likely get to sleep through the night uninterrupted by a child needing water and (b) can use their bathroom without slipping (or sitting) in a puddle of urine…(who has boys…raise your hand), prevent me from visiting this amazing destination. And the result was a great success! The kids had a great time and were thoroughly entertained, the adults felt like they were on holiday (as much as you can with three boys…so not that much, but more than a Tuesday night at Nandos) and no romantic dinners were ruined as a direct result of our family! 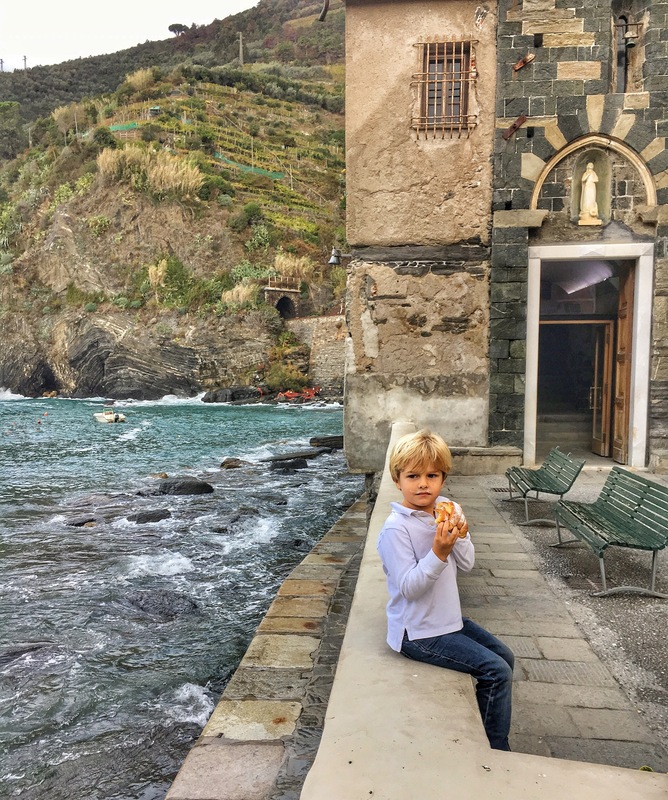 So check out my Cinque Terre kids travel tips below and start planning your trip! WHICH VILLAGE TO STAY IN? : We love Vernazza. The large cafe-lined piazza, which is directly on the water, is a great place for parents to sip a well deserved glass of wine or an early morning cappuccino (or a well deserved, early morning wine…I won’t judge) while the kids kick a ball around. The elderly residents of Vernazza seem particularly adept at dodging both children and a variety of sports equipment during their evening passegiata. There are plenty of restaurant and cafe options, many of which have sea views. 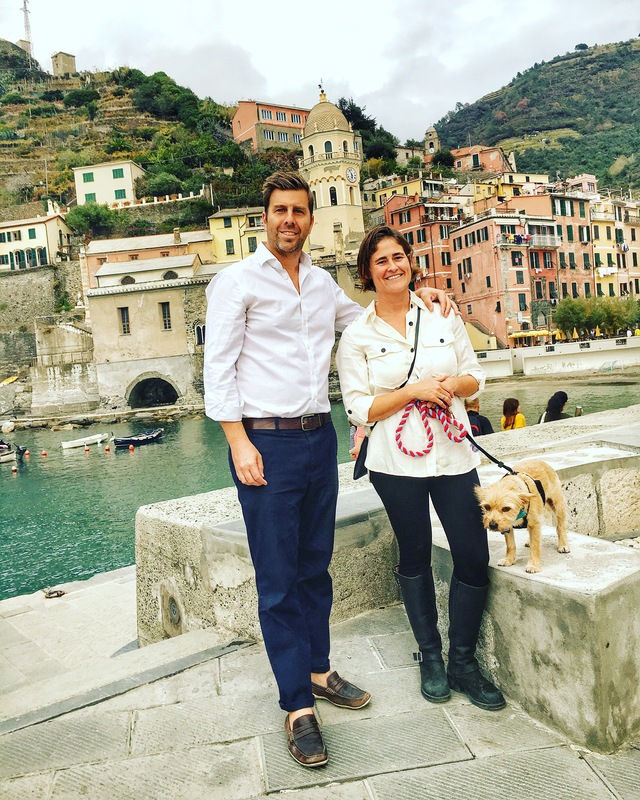 Like all of the Cinque Terre villages, Vernazza is small and there are plenty of accommodations (we rent apartments typically through either Airbnb or booking.com) within a seven minute walk to the main piazza, even for our family of five (and our dog!). Manarola is our next favourite village. The biggest downside is less open space for the kids to run around. Also the main piazza looks down on the harbour. While not a safety issue, at last count we have watched three footballs float out into the Mediterranean. 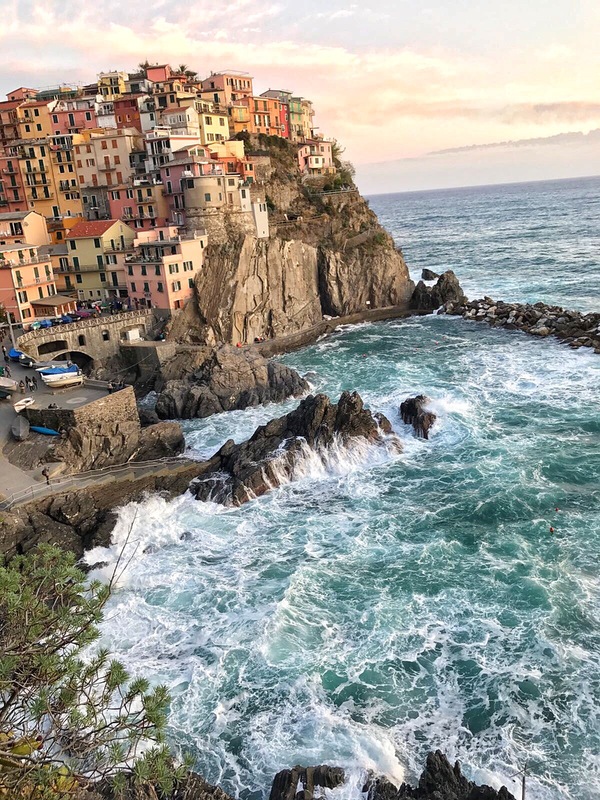 OFF SEASON TRAVEL: Ok, so a bit of fairly obvious advice….but Cinque Terre in late June through early September is best avoided with younger kids, unless waiting in a 2 hour line for gelato in the crushing heat and with a constantly whining dad child seems appealing. We’ve now been twice in April (avoiding Easter) and once in late October. The days are still busy in the villages with short break and day trippers, but in the mornings and evenings the villages are gloriously empty. 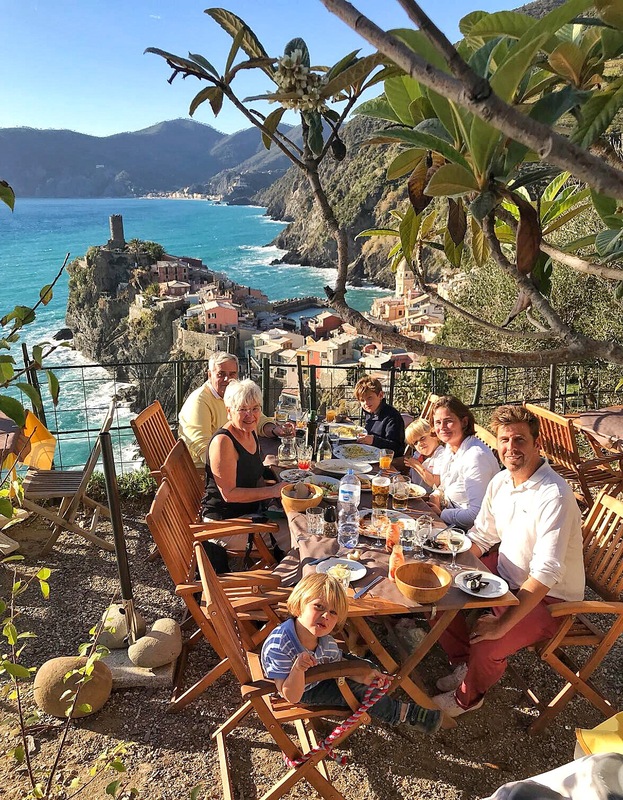 TAKE A HIKE: We managed to hike as a family from Vernazza to Monterosso, with our middle son, Hatcher, the kid who can’t walk the kilometre to school without whining and crying, leading the charge. Not to be missed are some of the restaurants in the hills as you descend into Monterosso. Less successful was my hike from Corniglia to Manarola with Hatcher and my oldest Harry. While the views were some of the best we saw all weekend, I misread the distance and difficulty, we just missed the one bus (runs every two hours) from Volastra, and almost wound up in tears myself as I carried Hatcher and our dog through a set of unmarked trails. 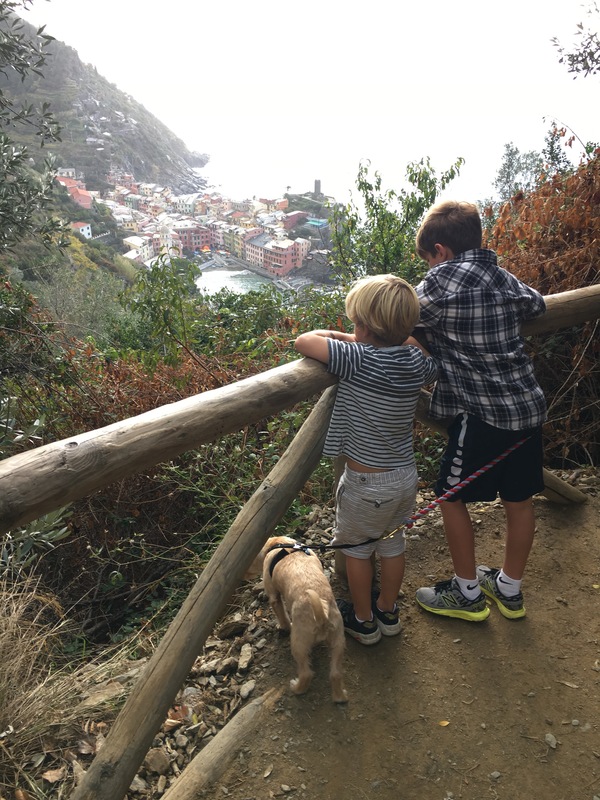 BOAT TRIPS: It is hard to beat the views when arriving at the different Cinque Terre villages by boat and the kids couldn’t be happier. And if you’re lucky, as we were, you may even see dolphins. There are day passes for the boats as well as single journey passes. And you can always combine a boat trip with one of the frequent trains that connect the villages.